I didn't want to buy stencils. I really didn't. See, I'm making this cake--which I'll post later--and had an idea for decorating it: since today, potluck day, is the day after Valentine's Day, I thought I'd put heart shapes on it instead of the snowflakes that Bon Appetit's bakers used. And instead of doing them as powdered sugar standing out on a dusting of cocoa powder on top of the cake, I wanted to make thin little bittersweet chocolate hearts and arrange them on top of the cake (with or without a dusting of cocoa powder). I chose bittersweet chocolate so that when they cooled and hardened they would be fairly rigid. The problem, aside from the fact that I don't have a chillable marble slab at my disposal, is that the only way I've ever seen something like this done is with a stencil that's about 0.5-1 mm thick: you lay the stencil down on your work surface, use a spatula to spread chocolate over it, carefully lift up the stencil, and voila! A nice, neat chocolate heart--or star, or gingerbread man, or whatever shape you're using. And I don't have any stencils, heart shaped or otherwise. Nor do I have heart-shaped cookie cutters. So this afternoon when I got home from work I started looking around the house for materials I could use to make a stencil. Apparently I don't have any such materials. I have some bits of plastic, but they're too tough to cut with the level of accuracy that I want (jagged hearts are not what I'm going for). 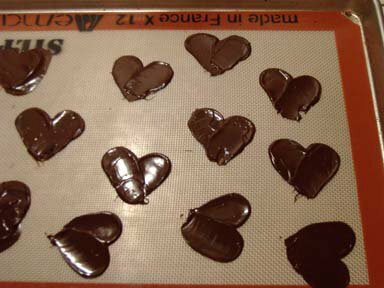 Parchment paper is easy to cut, but too flimsy to be of any practical use, as I found out when I tried to spread chocolate over it and ended up finding chocolate underneath the stencil as well as on top of it (smeared, unrecognizable hearts are not what I'm going for, either). The ones at the bottom are quite a bit neater--obviously they were the last ones I did. Anyway, that was my stroke of brilliance--nothing that hasn't been invented before, I'm sure, but I'm pleased so far with the results: the free-form hearts are nicer looking (if less perfect) than ones made from a boring old stencil, as they're flowy and have some texture to them. The form isn't perfect, and it's a little difficult to get a nice point at the bottom, but they should do the job nicely. Now, if only I can get them off the silpat without breaking them... stay tuned! Hi, Anne. It's Beth. The one of Steve's siblings you have not yet met. Steve turned me on to your blog. I do a lot of cake decorating, so I have a simple solution to your heart problem. It's called run-in stenciling. You take waxed or parchment paper and tape it on top of the image you'd like to create, (like a heart). Use a pastry bag with a writing tip to go over the outline with tempered melted chocolate. Leave it to harden . Come back with the bag of re-melted chocolate. Squeeze it in the center and let it run out to the hardened outline. You can do this with all kinds of shapes and play with colors, tinting white chocolate to fill in a dark chocolate outline, or whatever. It's super simple and yields professional-looking results. Have fun! Hope to meet you soon!